Eastern American Diocese of the Russian Orthodox Church Abroad - Brooklyn, NY: Eastern American Diocese greets Myrrh-Streaming Icon of the Mother of God "Softener of Evil Hearts"
On Saturday, March 23, the myrrh-streaming icon of the Mother of God "Softener of Evil Hearts" arrived in the Eastern American Diocese from Moscow. The holy icon and its guardian, Sergey Fomin, were greeted by Archpriest Serge Lukianov (rector of Holy New Martyrs & Confessors of Russia Church in Brooklyn, NY). On Sunday, March 24, Divine Liturgy for the 2nd Sunday of Great Lent, the feast of the Holy Hierarch Gregory Palamas, was celebrated in Holy New Martyrs Church, under the aegis of the myrrh-streaming Icon. Services were led by Fr. 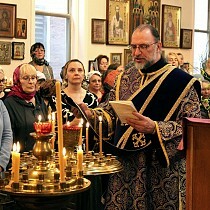 Serge, Archpriest Petro Kunitsky (parish cleric), and Protodeacon Leonid Roschko (cleric of St. Alexander Nevsky Diocesan Cathedral in Howell, NJ). A large number of parishioners and faithful from other Brooklyn and New York parishes gathered to pray before the wonderworking Icon, and to commune of Christ’s Holy Mysteries. 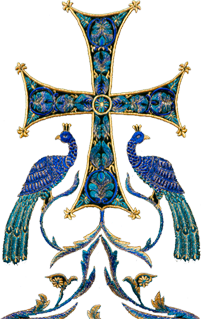 Upon completion of Liturgy, a short moleben was performed before the holy image. On Sunday evening, the holy icon visited Sts, Cosmas & Damian Church in Passaic, NJ, where a moleben and akathist were served. Fr. Serge led the moleben, co-served by Archpriest George Konyev (rector of Three Saints Church in Garfield, NJ), Abbot Arseny (Manko; parish rector), Priest Stephen Kaznica (rector of Sts. Peter & Paul Cathedral in Passaic, NJ), and Priest George Kaplanov and Protodeacon Leonid Roschko (clerics of St. Alexander Nevsky Cathedral).